When she’s not busy enacting change in the garment industry or making the latest sustainable fashions look amazing, model Summer Rayne Oakes likes to get back to her roots – literally. The Brooklyn resident and self-proclaimed plant lover recently told us that she transformed her apartment into a verdant oasis filled with over 200 plants. Click through our photo gallery to take a tour of this veritable urban greenhouse, and check out this inspiring video showing how Mingo Design helped Summer create a flourishing vertical garden wall right in her living room. INHABITAT: What inspired you to start a vertical garden in your home? SRO: I’ve been transplanted from the country to the city, so I always feel the need to create a living environment that feels like “home.” A green wall was a dream of mine for a while, but I couldn’t really think about the possibility until after my roommate moved out, which was a few years back now. I couldn’t create one right away, however, because shortly afterward we started using the extra room for Source4Style office stuff. When Source4Style got a new office space, I spoke with my friend Kyle, who is a contractor in the city, and he offered to find someone to help with the build-out. We started planning it over the summer and commenced build-out this past December. It was a dream come true. INHABITAT: Do you have a favorite plant or feature in the vertical garden? SRO: The subirrigation system is the coolest feature because it waters itself when the plants are thirsty. When the water goes down, the roots signal the subirrigation system to turn on. So it’s self-watering – and it waters the plants from the bottom up – where the roots are – vs. the top down, which is key considering that I live in an apartment and I have someone below me so I wouldn’t want any spillage. As for plants, I love this one that I put in that wasn’t originally tested on the wall…It is a Stephanotis floribunda or Wedding Vine flower, which is a climbing plant that has tubular fragrant flowers that smell like jasmine. It’s been in the wall for three months and doing very well. INHABITAT: Some urbanites might be intimidated by the perceived cost of installing a vertical garden. Is it usually pricey or are there affordable options? SRO: It really depends on the size, scope and scale of what you’d like to do. You can do a small DIY box vertical garden if you want for probably $40. My dad and I just installed a mason jar herb garden on the kitchen wall for about that price. Or you can do something for tens of thousands of dollars. Or you can find something in the middle range. My own wall, which has 80 plants and subirrigation system, was an investment – but not expensive, especially for what it brings to my mood and the space; forgoing the watering system and opting for hand-watering would make it even more affordable. I’ve had a number of people in my space since and my friend Ron has decided to do one for his home, which is lovely that it can inspire people to bring more plants into their lives. INHABITAT: Do you have any advice or resources for people wanting to start a vertical garden in their apartment? SRO: Get a sense of what plants grow well in your space with the light you have available (unless you decide to put additional lights). Not all species of plants grow well uniformly. I originally wanted to try bromeliads and orchids because I liked the look of them, but they were tested in the greenhouse beforehand and they didn’t do so well, so we stuck with 15 species that thrived. I now have since tried out four more species, all of which are working well, which is nice to see. You want your green wall to grow well not just when you put the plants in – but for months and years afterward. For people in the New York area, I would suggest calling Kari and Edwin at Mingo Design. They helped design and build my wall. But I’m sure there are a few other good resources out there as well. INHABITAT: With so many plants in your home, do you feel like the air is fresher at all? SRO: If the air is not fresher, then my mood is. It’s so wonderful to be in the presence of plants – and I hope my plants feel the same way about me. INHABITAT: How many plants do you now have in your home in total? Thanks to Summer for inviting us into her flora-filled home, and stay tuned for some of her fun DIY projects like the closet vegetable garden! My love for the plant world grows and develops every year. The outside of my home looks like a jungle and we have plants throughout our home. I have had friends build me vertical shelving but I have out grown each new piece ;) . My family and I are moving from S. Tx to Oregon and to house my love we plan to re-create an aWarehouse into our Living Living space. I ill definitely be looking into artists like Mingo Design! thank you both Summer and Mingo Design, you have inspired me! :) Live the life you love! During the day you'd be getting more oxygen from the plants. But best not to have plants in your bedroom overnight - they respire too, which means they are using your oxygen, while not producing oxygen during hours of darkness. I hate to say it, but with so much humidity in the air there is likely to be damage to the structure. When she's not busy enacting change in the garment industry or making the latest sustainable fashions look amazing, model Summer Rayne Oakes likes to get back to her roots - literally. The Brooklyn resident and self-proclaimed plantlover recently told us that she transformed her apartment into a verdant oasis filled with over 200 plants. Click through our photo gallery to take a tour of this veritable urban greenhouse, and check out this inspiring video showing how Mingo Design helped Summer create a flourishing vertical garden wall right in her living room. Summer's vibrant new vertical garden. We were so intrigued by (and jealous of) Summer's rainforest-esque digs that we had to catch up with her and see if she had any tips for aspiring urban gardeners like us. Read on for her tips. INHABITAT: What inspired you to start a vertical garden in your home? SRO: I've been transplanted from the country to the city, so I always feel the need to create a living environment that feels like "home." A green wall was a dream of mine for a while, but I couldn't really think about the possibility until after my roommate moved out, which was a few years back now. I couldn't create one right away, however, because shortly afterwards we started using the extra room for Source4Style office stuff. When Source4Style got a new office space, I spoke with my friend Kyle, who is a contractor in the city, and he offered to find someone to help with the build-out. We started planning it over the summer and commenced build-out this past December. It was a dream come true. INHABITAT: Do you have a favorite plant or feature in the vertical garden? SRO: The subirrigation system is the coolest feature because it waters itself when the plants are thirsty. When the water goes down, the roots signal the subirrigation system to turn on. So it's self-watering - and it waters the plants from the bottom up - where the roots are - vs. the top down, which is key considering that I live in an apartment and I have someone below me so I wouldn't want any spillage. As for plants, I love this one that I put in that wasn't originally tested on the wall...It is a Stephanotis floribunda or Wedding Vine flower, which is a climbing plant that has tubular fragrant flowers that smell like jasmine. It's been in the wall for three months and doing very well. INHABITAT: Some urbanites might be intimidated by the perceived cost of installing a vertical garden. Is it usually pricey or are there affordable options? SRO: It really depends on the size, scope and scale of what you'd like to do. You can do a small DIY box vertical garden if you want for probably $40. My dad and I just installed a mason jar herb garden on the kitchen wall for about that price. Or you can do something for tens of thousands of dollars. Or you can find something in the middle range. My own wall, which has 80 plants and subirrigation system, was an investment - but not expensive, especially for what it brings to my mood and the space; forgoing the watering system and opting for hand-watering would make it even more affordable. I've had a number of people in my space since and my friend Ron has decided to do one for his home, which is lovely that it can inspire people to bring more plants into their lives. INHABITAT: Do you have any advice or resources for people wanting to start a vertical garden in their apartment? SRO: Get a sense of what plants grow well in your space with the light you have available (unless you decide to put additional lights). Not all species of plants grow well uniformly. I originally wanted to try bromeliads and orchids because I liked the look of them, but they were tested in the greenhouse beforehand and they didn't do so well, so we stuck with 15 species that thrived. I now have since tried out four more species, all of which are working well, which is nice to see. You want your green wall to grow well not just when you put the plants in - but for months and years afterwards. For people in the New York area, I would suggest calling Kari and Edwin at Mingo Design. They helped design and build my wall. But I'm sure there are a few other good resources out there as well. The plants in Summer's kitchen get a lot of light. INHABITAT: With so many plants in your home, do you feel like the air is fresher at all? SRO: If the air is not fresher, then my mood is. It's so wonderful to be in the present of plants - and I hope my plants feel the same way about me. The modular setup of the vertical garden makes it easy to swap out plants for other ones. Summer lending a hand setting up her vertical garden. When she's not busy enacting change in the garment industry or making the latest sustainable fashions look amazing, model Summer Rayne Oakes likes to get back to her roots - literally. The Brooklyn resident and self-proclaimed plant lover recently told us that she transformed her apartment into a verdant oasis filled with over 200 plants. 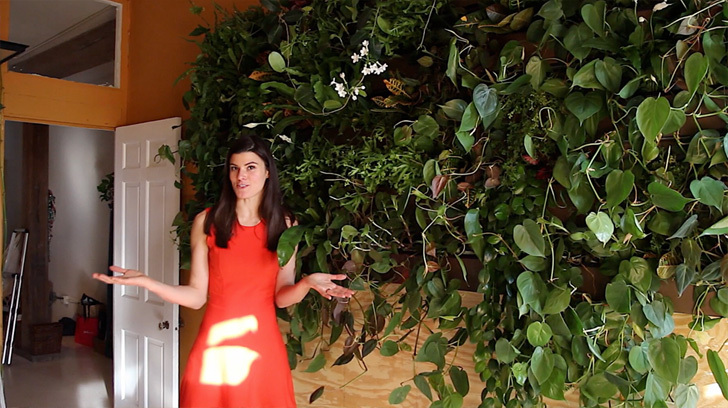 Click through our photo gallery to take a tour of this veritable urban greenhouse, and check out this inspiring video showing how Mingo Design helped Summer create a flourishing vertical garden wall right in her living room.